Made in England, United Kingdom, Europe, c 1900. This machine is a hand-powered chaffcutter typical of those used to cut up hay and straw for animals, notably horses, both on Australian farms and in the cities. Crops were also chaffed before they were put into the silo, to ensure close packing and to prevent fermentation. The essential components of this chaffcutter are the two, curved knife blades fixed to the spokes of the flywheel, 3 ft 6 inches (1.1 m) in diameter, which cut the straw. The knives are attached to the flywheel with four nuts and bolts each and could easily be detached for sharpening and renewing. Uncut straw or hay was placed in the chaffcutter's chute and was seized by two toothed rollers and then fed to the rotating knives. When the flywheel was rotated, by turning the handle, the knives slide against a stationary shear-plate. The gear on the side of the chaffcutter could be altered to change the speed of the rollers relative to the speed of the flywheel and knives. Since this changed the relative speed at which the straw or hay was fed towards the knives, it controlled the length of the pieces of cut material which made up the chaff. Horses and cattle were given chaff cut into 1-inch (2.5 cm) long pieces while sheep had about a quarter of an inch (0.6 cm). The chaffcutter is mounted on a 4-legged cast-iron stand decorated with pieced brackets. Number on side of machine: 1626. The design of the chaffcutter has its origins in Somerset, England, when James Edgill of Frome introduced a chaffcutter with a single spiral knife. This was followed by a hand-powered chaffcutter patented in England in 1794 by the Reverend James Cooke of London. 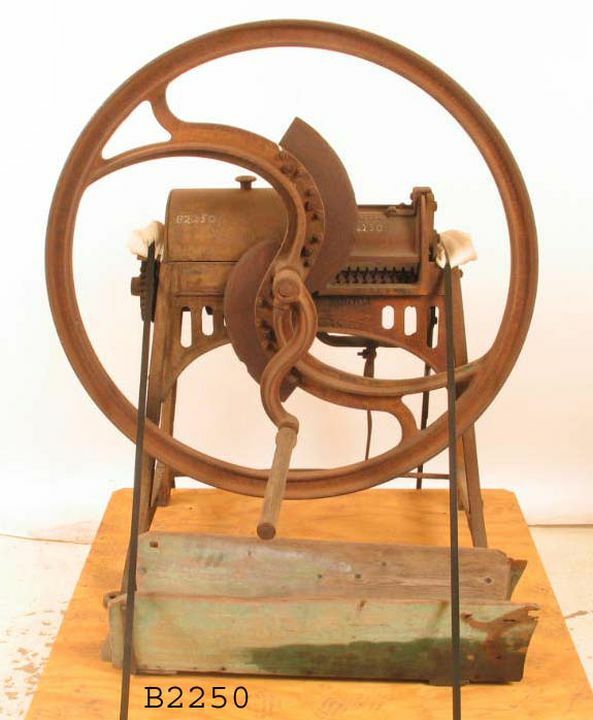 This machine consisted of rotating knives attached to the spokes of a flywheel which pressed against a stationary knife set in the floor of the feed box. In 1800 McDougall invented the three-bladed cutting wheel. Later designs added toothed rollers to grip the uncut straw and feed it towards the rotating knives. Hand chaffcutters usually had two blades on the flywheel while power machines had two to five blades, according to the capacity and length required. This chaffcutter was made by the well-known English firm, E.H. Bentall & Co. of Heybridge, Maldon, in Essex. William Bentall began making ploughs and other farm machinery in Heybridge in 1805 where a large foundry was built. William's son, Edward Hammond Bentall, took over the firm which went on to manufacture a number of other machines including corn crushers, root cutters, threshing machines, reapers, horse works and oil engines. The chaffcutter was donated to the Museum by Mrs G. J. Garard of Liverpool, NSW, in 1977. It came from her property at Luddenham which was originally part of the Crown Grant of 6710 acres made to John Blaxland in 1813.